Refer to the section on the Principles of Operation. Here we take a look at a practical example of the concept outlined in the previous section on the principle of Computational Imaging. Three monochrome full resolution images are captured sequentially. To get the color information, each image is strobed with a single color - Red, Green, or Blue. A color image with the full resolution of the monochrome camera can be created from the data of the 3 input images. In this example, 3 monochrome 8-bit 1600 x 1200 images are combined to make a 24-bit color 1600 x 1200 image. 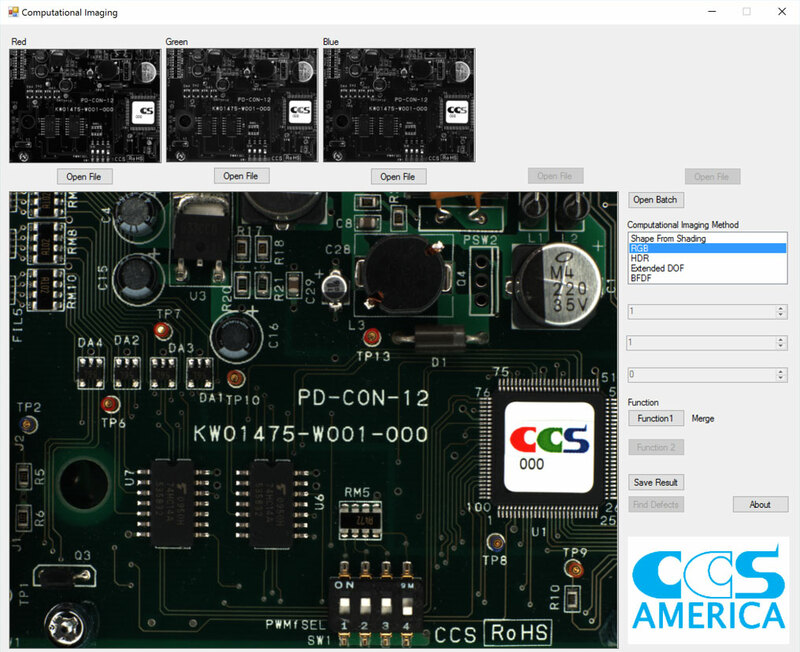 The advantages of this method to create composite color images become apparent as you zoom into feature details, as you might in a machine vision inspection. In the zoomed image 1a, you can see the two exposed windings of the coil wire and the exit wire to the solder point. The edges are sharp and transitions are smooth with good contrast. In image 1b, the Bayer interpolation artifacts cause the wire to alias red + green along its length. Contrast to the background and between wire layers is reduced and noisy. You can see similar effects in the 2a + 2b zoomed images. In the Bayer image 2b, the white silkscreen is almost completely Bayer noise. The red/gold/black boundaries of the test point in the lower corner become blurred and wider. In the 2a equivalent image, the silkscreen and test point are sharper, with good contrast and color.